Nick Prince is making the switch from banking to barbecue. The Fort Worth native is bringing a taste of Texas up north with the opening of Post Oak Barbecue at 4000 Tennyson St. this summer. The upcoming restaurant is taking over the former space of Block & Larder, which closed in January. Prince, a former commercial banker, said the eatery will serve “Central Texas-style” barbecue cooked over post oak wood, and made with simple rubs and sauces. The counter-service restaurant will slice and weigh the meat in front of the customer, who pays by the half-pound. Post Oak’s brisket, which Prince thinks is his best offering, will sell for $11 per half-pound. Other menu items include spare ribs, house-made sausage, wings and loaded baked potatoes. The barbecue joint also will have a full bar — left over from Block & Larder’s build-out — stocked with craft beer from both Colorado and Texas. Prince said he’s always had a passion for barbecue, and couldn’t find the same smoked meats in Denver that he grew up with in Texas. So he taught himself how to make his own Texas-style barbecue and started entering competitions 10 years ago. Late last year, he decided to take the plunge. “I wanted to start making true on the things you tell your kids — that you can do anything you put your mind to,” he said. Prince took over the 2,900-square-foot site in January, after buying Block & Larder out of its lease and purchasing its equipment. Part of the appeal of the former Block & Larder was that the build-out already was done; the only renovations needed are modifications to turn the previous full-service restaurant into a counter-service model. Prince plans to hire 15 to 20 employees, and he’s bootstrapping the entire operation. Post Oak is at least a few months out from opening, Prince said. But when it does, it will open at 11 a.m. every day except for Monday, when it will be closed. Tuesday through Thursday, the restaurant will stay open until 10 p.m., and until 11 p.m. on Friday and Saturday. Sunday will feature a “brunch-lunch combo” until at least 3 p.m. The upcoming smokehouse won’t be the only Southern-style barbecue spot in Berkeley. Ragin’ Hog BBQ at 4361 Lowell Blvd. claims to serve “authentic, Southern-style barbecue,” according to its website. 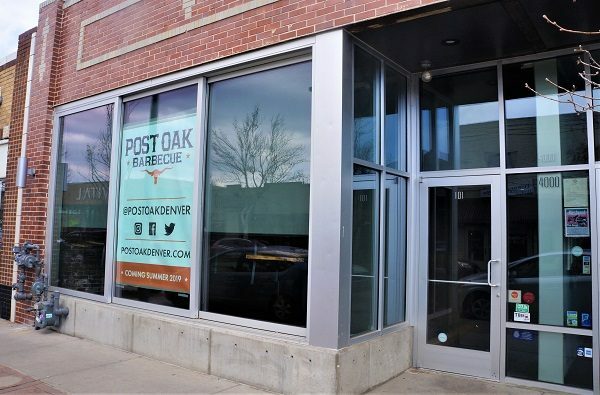 Prince, though, hopes to carve his own hole in the Denver market, with plans to open a second Post Oak Barbecue within two years and more down the line. Also, the business will launch a catering service within a few months, Prince said. Berkeley Park Sushi also will open in the neighborhood this summer.